Hang in there, Chelsey! You’re doing the right thing! This is a great post. Absolutely love it! I’d like to share you blog via a link from our family blog, http://www.TheHighamFamily.com. I think more parents need to read this. As a pastor, I’d rather have the kids in the service doodling than in a “kids” service (which is really just baby sitting that gets the kids our of worship) or playing on a device! Thanks for the repost and for your encouragement, Jay! Pastor excuse me, but how arrogant to make such a blanket statement regarding kid’s services. Have you visited many children’s services? Do you really believe that the only person that can adequately preach is you. Do you believe that God can only work or move in the room where you are speaking. I mean no disrespect, and I’m sure that you don’t intend to communicate these things, but to say that kids services are “really just baby sitting that gets the kids out of worship” does imply that the only place the Holy Spirit can work is in the room with you. How sad to have such a small view of a God and such a flawed and small view of children’s ministry and its leaders. Matt, thanks for your comment. And you are correct, this was not meant to be a blanket statement, however I have served as a youth and family pastor for over 20 years, and a lead pastor for the last 3, almost 4 years. I have worked with Christian Ed and Chilren Ministries, attended multiple seminars and training events, considered a multitude of children’s church models, witnessed first hand what we did in our churches, and visited other churches, so I do feel as though I am acquainted with the children’s church. It has been my expereince that many parents, but NOT ALL, are not as concerned with what happens in the children’s time during the worship service. They simply want to know that their kids are being taken care of. Even now, as I want kids to stay in the service, I have parents that push for an alternative, saying that their kids can’t sit through the service. In many churches, NOT ALL, children are dismissed to a classroom where kids can play, maybe hear a bible lesson or watch a bible themed movie, work on coloring pages or crafts, or something of the like. With the average sermon time running between 20 and 40 minutes, there’s not much time for full out lessons and in such cases, this is more of a babysitting service than a teaching time. Now there are many churches who do utilize this time well, and I applaud them. I have also visited and talked with staff of churches who split up the family, offering special programming for children and students while the parents/adults attend worship simultaniously. Again, in some churches this seems to work well. But my point was more focused on what worship is really about and that as parents, we have the responsibility to teach our kids that church and worship is about glorifying God first and not about whether they or we think it is entertaining and relevent. But as I look at churches who split the family during the worship hour offering a separate children’s ministry and student ministry, my question would be, When do we teach our kids the importance of worship? This has less to do with who we think has the ability to “preach” and more about whether or not we are teaching our kids, and parents for that matter, what worship is all about? The worship is for God, not us. For the church who has figured out the balance between the worship service and a kid’s church that works, great, that’s awesome. But for many, the balance has not yet been found. On a personal note, I have five kids ranging from age 17 to 6. And we have tried both keeping our kids with us during the worship and teaching time and sending them to a kid’s church. As parents, we lean more towards keeping them with us, teaching them not just how to sit still and be quiet, but how to learn to worship. And yes, as pastor, I love to see families keep their kids in the service. For me, it help to remind me that God’s word is for everyone at every age and that my responsibility to is keep that in mind as I teach. The Holy Spirit can work wonders, even in the hearts of our kids. My first thought was to wonder if my pastors ever thought that the work we volunteers did with children was just baby sitting. I know that some of us worked as prayerfully and diligently on our preparation as any pastor ever has for a sermon. But if these low opinions are the pastor’s expectations of volunteers, then the volunteers probably give what is expected. Jay, you said, “When do we teach them about worship?” Again this statement assumes that the only place this can happen is in big church. Let me ask you a question, who is your worship service designed for? It is designed for someone. If not, then why have any decorations in the room. If what we want to teach is that worship is about God, which I happen to completely agree with and do teach in children’s church, then why do we decorate our worship spaces the way we do? Who chooses the music? Who decides what will be taught? The truth is that all of these things, in nearly all churches, is aimed at adults. One could say that they pray over what to preach and are led by God. That’s great, but when you prepare the message do you consider the children in the room? Chances are most pastors that push for kids in big church give no consideration to the level of understanding of the children in the room. Our God is a God of order, not chaos. When a preacher preaches at a level that is too high for the kids it creates chaos for that child, not order. It leaves that child thinking that the things of God are only for grown ups. Let me ask you another question, why did Jesus so often use agricultural examples when teaching? He did this because he was speaking to an agricultural society. He met them where they were and taugh them in a way that they could understand. When we insist that children must be in big church and we preach over their heads are we meeting them where they are? Are we teaching them in a way that they can understand. I thank you for receiving my comments as they are intended, as a point of discussion and not a rebuke or attack. At the end of the day, as you sorta pointed out, different models work for different churches. What works, or doesn’t work, in one church is different from another. At the end of the day the question is, is it working? Thanks for writing this! I agree. We go to a church where they do have classes for kids up through 5th grade during the service. My now 11 yr old son is with me in every service (he’s too old) and so is my 9 yr old daughter (just by her choice). When my oldest isn’t listening he has started reading the Bible through during church! He protests frequently about how bored he is, but my heart sings as I watch him read The Word or look up and laugh at something the pastor said. I am so thankful that as a young mom I was encouraged to love my kids by making the tough choices for them…even when for the moment I may not be all that popular. Thanks for encouraging me again! How neat that he’s reading his Bible, Kathy! Thanks so much for your comment! OK, how about a follow up blog discussing when a child should be taken to big church. How do you know they are ready? I think that’s up to each parent to decide. I’ve seen several blog posts about the benefits of starting from infancy. Personally, in our family, we’ve decided on age 5, one time per month. They come the same week that we tithe and they also bring their offerings (they start doing chores and earning an allowance at age 5 as well). In our church, children’s church goes through 3rd grade, so by around age 9 they will be in with us full time. Thanks Melissa for your reassurance that it’s ok for them to be bored! I like to have them fill in the message outline blanks, but let them draw in between. Good idea on the message outline, Sara! Thanks! We started taking our children when they were about a week old. They just have to learn and they will. Yes there were times that I spent half of the service walking back and forth in the back of the church or had to take them outside to be disciplined. We are Missionary Baptist and don’t believe in Children’s Church or any of that. Everyone that goes attends the same service. My son referred to our pastor as “Pastor Boring” a few years ago. This past week he took notes. They are hearing for sure! Chad, what I’ve found is kids are ready for big church, it’s the parents who don’t want them in there because they would have to tend to them and expect certain behavior for 40 minutes. When we have a family friendly service with no kids church or childcare those families don’t attend. My 6 children have sat with us in church since birth. During infancy I did go to the cry/nursing room during the sermon if one was available. We have seen many benefits from this practice. As a missionary we have often been asked to speak in Jr. or children’s churches and I have found that in the vast majority of cases Jr. church is just chaos – disorganized, loud and confusing. In foreign countries they don’t have children’s church unless they have been too influenced by Americans! 🙂 I believe that children’s church is more a convenience for parents who don’t want to train their children, and for those who can’t handle a bit of noise during the service. In Central and South America people of more accepting of children. When a Mama of 6 talks, I listen! Thanks for your comment, Mama! I agree that children should be in regular church- If we are obedient to God by bringing them to his house of worship every week and training them in his ways – He will bless us and them for our faithfulness- A family that worships together stays together- If in your church there is no children crying-then it is a church that is dying- God loves our children even more than we do. I agree, Letha! The sounds of little ones in the service should make us all feel glad ! Melinda, ha ha! How cute that your grandson approved of the message! Thanks for your comment! At what age does this age bracket end? That’s my question and here’s the follow up: where in scripture do we find this bracket and where in scripture do we find it ending? Adam, do you mean the bracket of childhood? Or of the ages where you would send kids to children’s church? Amen! Just had a mom tell us today that she asked her four year old what happened to Jesus after he died, expecting him to say that Jesus rose from the dead. Instead, the little boy said, “He descended into hell.” That kid was listening to the apostles’ creed which we speak each Sunday in church worship! I think it’s better to try to make things “good” instead of settling for “okay”. Brad, I don’t necessarily consider it “good” for kids to be bored in church. But, as an inevitability, I do think that it’s okay for it to happen now and again. After all, no one can be absolutely riveted at all times. However, I do think that it’s good for kids to learn that they are part of a larger body and that they don’t have to have bells and whistles. The word of God stood fine on its own long before children’s church existed. Good preaching and corporate worship just doesn’t feel like “settling” to me. Thanks for your comment! In regards to what exactly? My kids grew up (2-7) in a one room church plant. So my kids were in the service all the time. I use to think how you thought. But in reality kids this young tune out the pastor and focus on colouring and asking for a snack. My daughters really didnt pick anything up until we started going to a different church with a kids program and they would come out telling me wonderful things about Jesus and what they learned in the bible today. Kids programs teach in a language small kids understand and can relate too. Of course we always and still enjoy worship together . Rebecca, it seems that you and I have had two different experiences. I’m sure there are all kinds of factors that determine how much a child gets out of a sermon. But, as far as my kids go, I have found that they actually aren’t tuning out the pastor, and they are learning. Of course, they learn through a variety of different things, including Sunday school, Wednesday night programs, etc. But, they can clearly articulate what the sermon is about each Sunday. Also, Rebecca, if you’re talking about two year olds, then I can understand how they might not get much out of it. But, by five or so, I think that kids aren’t missing much that’s going on around them. Thanks for your comment! YES! Thank you for stating this, Rebecca! The target audiences for church sermons are adults. When we put children in that environment we teach them at least two things. 1. God is irrelevant and they’re not important to Him because He isn’t speaking to them. 2. They learn that God is setting them up for failure and waiting to punish them when they subsequently fail. Is there any other situation where we would expect children to sit through lectures that are targeted towards adults and then get upset with them for being children if they don’t sit quietly? No. Respectfully, they have no business being put into that situation to begin with because it is a recipe for disaster. They learn to drown out what’s going on and color for an hour quietly, or they “misbehave” and get in trouble. There are plenty of programs at LifeWay that help engage and teach children valuable lessons that are age appropriate. I’m concerned about the future of our church, because at the rate we’re going, following the same routine that has gotten us where we are is the definition of insanity. I will go so far to say that if your kids are “bored” during church, then you should probably go to another church that values teaching children enough to have a place for them. Jennie, I think age segregation is a big part of the problem with the church today. If you think about how many centuries it has been alive and what has changed since it started becoming so shallow and wishy washy, it would be the focus on entertainment, making sure people are made “happy” by the church so they’ll keep coming back. Special programs for all ages, big music that is more like a concert than congregational singing, sermons that carefully don’t offend people, all these things just add up to a weak, selfish group of people that is more concerned with making sure there’s childcare during their ladies bible study (which usually turns out to be a study of another book) than with the actual topic of the study. Abby, have you actually attended one of those “shallow” churches or are you just basing your opinion on gossip and rumors? If your church is seeing souls brought to Christ by the hundreds every week then I will gladly agree with you. If, however, the baptismal waters are rarely stirred, then maybe you aren’t seeing the real problem. We need to focus on what we’re supposed to be focused on – CHRIST- instead of attacking the ones that will live out the passage that says we are to be all things to all people so that we may win some. Amelia has done this very thing for years, and while I used to fight the drawing, I stopped because she always knew what was being taught. Great article! You know, I still remember some of the pastor’s stories forty years later, while I was drawing and occasionally falling asleep on my mother’s shoulder. And those stories, as well as the many I can’t remember but surely heard, formed my little understanding of the world. Our church has only family church then separate children’s classes after the sermon is over. My kids (aged 11, 8, 5 and 3) all come with us and have since birth. Sometimes the kids are bored and I’ve brought “churchy” books for them to play with, but I think most of them are ready to just have paper and pencils and just pay attention. Thanks for the article! Hi, thank you for sharing these thoughts. It mirrors how I was raised in church. My parent supplied notebook and pencils/pens and encouraged me to draw about whatever was being preached. This is exactly how I was taught to attend to messages in church. During college at a fundamental school, I heard a message on how to respond in church (how to take away something from the message.) The preacher was careful to say that there will be sermons from preachers who don’t quite sound like they are really preaching the Word. In that case, take the main points with a grain of salt. But, for all messages, seek out something to apply to your life even if you may not agree with everything. This preacher was adament that listeners are worshiping in how they listen, and respond to the sermon. That’s why it’s important to prepare your heart before the service “Lord help me to listen and to respond to your Word as I should” even if you don’t like the preacher. That has helped me more than I can say, in helping me to prepare for church, and respond when a message is given using scripture taken out of context, or the points were stretching the passage a bit. My dad, a missionary for 23 years, and now pastor for another 7, has always strived to provide outlines or means to follow the message and have something to take away. It’s not something that distracts from his message, but it enhances people ability to focus on the Word- when they know where the message is going. I think too, it is my dad’s way of making sure people get the main points, and assuring himself that he is clear. When he was preaching in another language during our missions years, it was a way for him to make sure people understood him despite his struggle with the language. don’t lose heart, when we prepare kids to understand that the sermon is important, and they have something to draw, then it’s surprising what they hear, and remember. Our three children (5, 3, 1) are all in church with us too. Our church doesn’t have a nursery so it’s not even an option. There are times, of course, when I think that it would be so much easier if we did, but on the whole having them in church with us has been a great experience. Our older two have learned to sit and look at books or draw during church since they were two or so. They definitely pick up on things that are said in the sermon too, sometimes loudly repeating back to me a phrase that they heard. One thing my husband does (he’s one of the pastors) is to prepare a kids’ sheet for taking notes on the sermon. It’s very simple, with a few pictures, maybe a key verse, and some of the key words from the lesson. It can be a good way to engage the kids in the sermon, though my kids usually just prefer to keep to their own notebooks. Overall, teaching our kids to be a part of the service, to understand the importance of the preached Word every week, and to practice self-control during a long period of time has been really beneficial. It’s good to be reminded of why we do it and I really enjoyed your post today! A kids service is not a babysitting or it isn’t in most churches that run them, its a way to engage them in worship in a style that is probably better suited to their needs. Im all for having the kids in adult church because I think they learn best from their parents, but I also LOVE that our church does awesome kids church along side adult worship (usually after the first few songs where were all together). Why because I think it gives my kids a chance to hear the gospel in a way that they can relate to and worship with their peers. I would also love to see those beautiful kids that sit in the front row thats lovely, but as soon as you get more then 10 kids or so its hard to keep them quiet through a sermon. Get 40 and its impossible… haha so I’m grateful for both and say its so wonderful that you parents who’s kids won’t sit quiet in smaller church’s are still bringing your kids along week in week out because its being in the house of God that is really important!!! Great post! This is our desire, as well. A month ago we added Baby 4 to our 3 year old triplets so we may take a break from our plans for a little while. But this is our desire as well. Thank you for sharing! Great post. I completely agree that it is ok for kids to be bore in church. I think that parents should worship together often. I think that kids need to be in big church often. 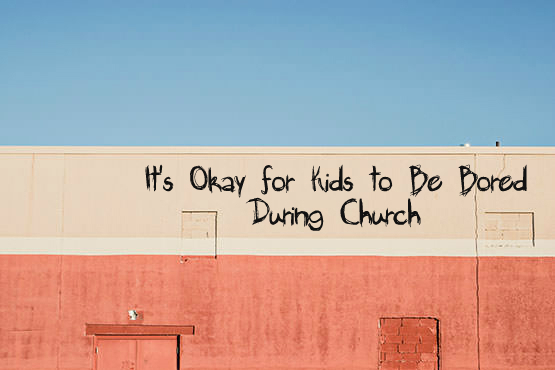 However, it is also ok for kids to have fun in church. Many people say that we shouldn’t create environments designed with children in mind. However, we do exactly that for adults. Everything about big church is designed with adults in mind (at least at the vast majority of churches. I’d love to know of examples where this is not true.) The design of the room is for adults, there music is for adults, the preaching is for adults. I challenge anyone to look at the many different elements of their adult worship space and adult worship service and consider who they were designed for. If we are honest we will have to admit, in most cases, that they were designed to meet the preferences of adults. I absolutely agree with what this article says. In fact, as a children’s minister, I continue to push that we do not provide children’s program during our Sunday evening service. However, I don’t think it is the only way to do it. Never thought of that before. Good point. Thank you for posting this article. My children grew up doing just that. We always sat on the front row. Keep serving our Great God & only SAVIOR. I was brought up this way & the benefits have been great for my spiritual life but also a big asset in my life in general. I learned to take notes in church, memorize, sit quietly, etc. All important skills in spiritual discipline and in life. God is so good! Melissa, a fellow pastor’s wife shared this article in our pastor’s wife Facebook group… all I can say is, THANK YOU! I’m a pastor’s wife with five young children, and I have struggled with what kind of behavior is okay for kids during church services. Your honest perspective helped me so much. Thank you for discussing this without demonizing children’s church! Too often it’s either children’s church is evil or children get nothing out of sitting in church and any church without children’s church doesn’t care about children. I advocated for a no children’s church on Fifth Sundays policy and so that’s what our previous children’s director did. We are no longer able to provide any children’s church and I’m hoping to see a children’s sermon instituted to include the children more intentionally in the service. Once our kids get old enough to not be disruptive in the service, they are required to attend with us. So the almost-3 year old gets a pass…for now. The older two (9 and 10) are stuck with mom and dad. The older kids both have expressed sentiments of being bored in church. Sometimes I despair at this, and it makes me sad. However, I also have to remind myself that I too, a soon-to-be-40 dad of three am very occasionally bored by church too. I am not going to lie when I say that I’m jealous of Lutherans and their 20 minute sermons. 😉 However, I also know that I am fed and nourished by church, and regretful when I miss Sundays. I hope that my children are fed and nourished as well. 20 minute sermons? We Lutherans get antsy once the pastor hits the 12 minute mark! 😉 It was quite a shift when I started attending another church to realize some sermons went for close to an hour! We have always kept our kids with us during church, in both churches that we have attended, even though they both have children’s church. I think we underestimate the intelligence of children! Yes, church can be boring compared to their normal activities, but everything doesn’t have to be about entertainment. Everything doesn’t have to be on their level! My kids have attended church since 9 months before birth, and going to church and sitting quietly for awhile each week is just part of our regular routine. They don’t know anything different. They LOVE shaking hands and chatting during the greeting time, they sing along with the hymns they’ve memorized, and settle right down and color during the sermon. My two year old has popped up suddenly and loudly whispered, “MOM!!! He just said Jesus!! !” at times, all my kids so far have names from the Bible, so they get excited when they hear their own name, or a familiar scripture, or other random things that stand out to them. Several weeks after we had a guest speaker my 6yo started telling a joke that he had heard during his sermon (I wouldn’t even had thought he’d “get” that joke)! Wow, I could go on and on, since this topic is dear to my heart! Now we are currently still in the training period with my fourth (16mo), so I’m not claiming perfection here at ALL!! And it definitely needs a foundation at home. We are memorizing scripture, my husband sings hymns to them every night before bed, and they love having someone read the Bible to them! Sometimes we read “Good & Evil”, published by No Greater Joy Ministries. It’s a Marvel comic style Bible story book. Otherwise we just read KJV and they love it! Do they get bored in church? Of course! But guess what… I do too sometimes! Just remember, kids aren’t nearly as dumb as adults think they are 🙂 I think children’s church for kids who wouldn’t be there without it, or for kids who don’t have a solid foundation at home is great though! I feel I have to defend the parents who send their children to children’s church. I know many who are struggling with faith with understanding and it’s too much to try to learn what they need in service to carry home for all week when your kid is whining they are bored and wants to go to the bathroom every 5 min so they can get up. The parent then misses out on the lesson. It may seem they are not concerned with what their children are doing in that 40 min. But in reality they are looking at what they are going to be learning from them for the rest of there life. Love this discussion, including the comments 😉 I especially enjoyed seeing the non-critical approach taken in the article – but simply putting parents at ease who may be wrestling with feeling guilty that their kids may be a little bored at times. I agree with both “sides”. There is never one cookie cutter way to do church, adult or children’s (as long as it is a bible teaching church). It depends not only on the demographics and personality of the church, but maybe moreso, on the church leadership being in tune to the direction of the Holy Spirit’s leading. There are pros and cons of either style. And there are many different churches that offer different styles. Find a church that fits your family and dig in. Btw, we also must be careful no to “eat our own” in criticizing one style/preference or another. If my own kids choose to rebel against their Christian faith at some point in their life, I truly doubt it will be because they either had to sit in adult church service OR were over entertained during childrens chuch. Thanks for sharing! How sad it is that there is a wasted opportunity here! Why force children to sit through a service, when they could be in their own service receiving solid Bible teaching? Maybe I am spoilt, because my church considers children’s church very seriously and is not at all a babysitting service where it gives the parents ” time off”. I feel it is time for churches to reconsider their priorities and put children’s church first, because their are the next generation! This is a great message! When I was younger we had children’s church but it was an actual worship. They had a different young man from our youth group prepare a sermon. The children took up a collection, we served communion, had prayer and singing. I have also been to children church that was just playtime. I think we should use discernment when allowing our children to go to these services. The article is amazing and comforting. I wish our church would discourage the use of electronics among the children. My daughter knows I do not play that. I think if more pastors and leaders made it known that this type of distraction is not okay less folks would allow it. I sat in Sunday School for an hour and then sat on wooden pews during the one service (no children’s church). I was often bored for two hours. Because of that, I am not a fan of “traditional” Sunday School and I often zone out when the pastor preaches, although I do still look up when he raises his voice and may laugh if his joke is funny. I may even be able to share some of what he said, but that does not mean I was engaged, I was just there. I agree that it is good for children to see their parents in church, but some will take this to mean we should eliminate children’s church/ministry all together and have children sit in a service weekly geared exclusively with adults in mind. Bill, you did a great job of communicating my biggest problem with folks that insist that kid should be in big church and not in children’s church. Ultimately EVERY service is designed with someone in mind. In big church that someone is the adults. As if somehow adults are automatically more spiritual or more mature, spiritually. Hmm.. Seems to me that Jesus might have said something about adult having to become like little children if they want to enter into heaven. It seems Jesus might have said something about adults having the faith of children. Hmm… Maybe we should do as Bill suggests and make adults go to kids services and expect them to behave like children. Of course that would never work because the adults wouldn’t put up with that and since the adults tithe and vote within the church and kids don’t, then we need to keep the adults happy. I had 4 kids that were taken to church every time the doors were open. What I found, if we sit on !the left , no farther than the 3rd row from the.front, my kids set still, paid attention and as soon as they could read even a little bit, I had them follow along in the hymnal. The secret was sitting close to what was happening. They were interested ,because they were involved in church. Now I take 4 grandkids to church. I follow the same principles I learned.with my kids. I’m often told I have the best behaved kids in church. Sometimes we have to think beyond conventional wisdom. Never sit in the back with kids who are learning about church. Let them sit up front so they can see what’s going on, at the altar and in the congregation. Ha ha! Susan, we always sat in the back so if our kids were squirmy or made noise, we could be out quickly with minimal distraction to others. Oddly enough they have all learned to sit still, be respectful and appropriate during the service, and my teen girls have taken to helping the young moms in church with their toddlers, bringing quiet activities or gently encouraging them to sit and listen while the mom has to take a sibling to the toilet. I think it’s not so much the location as the parental involvement. If the kids are included, engaged, and expected to participate appropriately in the service, they will develop those habits. My 3yo calls the older guys at church his “buddies” and at bedtime when I ask him what he would like to pray and thank God for, he usually says “My fwends at church!” and names several of the kids he plays with. What works for one family may not for another, but the important thing is we can each find the ways that work for us, and for our children. There’s no need to give up and decide that kids just “can’t” be part of corporate worship. Excellent article!! This is part of training our children to be social beings! That goes for the music as well. It is not supposed to be entertaining; it is supposed to inspire you to join in and sing to the Lord with enthusiasm! For those asking at what age children should be in corporate worship, there is a window ending at about 3rd grade when kids enjoy doing what adults do – if we wait until later to include them in worship they are more in tune to their peers than adults. Kids do need to sit down front (or in a booster seat) so that they can see what is going on. I wouldn’t enjoy sitting for a long period of time looking at the back of a pew and the back of someone’s shoulders and head! If we don’t include kids in corporate worship then they don’t become a part of the total church! Plan a worship study for children (see the plans for such in my book SIDE BY SIDE and other suggestions in my book WHAT’S IN WORSHIP?) and then have a service of recognition for those who have gone through the study. Also consider a Young Reader’s Bulletin which follows the regular bulletin but gives information about what’s happening and gives room for them to do such things and write names of those they would like to pray for or write or draw something about what the choir anthem or the sermon says. A sample of this is in WHAT’S IN WORSHIP? and also in THE NUTS & BOLTS OF CHRISTIAN EDUCATION. Kids are a part of God’s church, and let’s be sure that they know it and see the adults worshiping too! Right on, well said, you hit the nail on the head! Thank you for sharing your heart of this matter, I whole-heartedly agree! As a mother and teacher of Children’s church, I can see the benefits of both. Our kids sit in the auditorium with their families during the service right up to when it’s time for the sermon, then a special song is led to dismiss them for “Kids for Christ”. We sing songs, an elder reads a scripture, we read and talk about a Bible lesson, they color and create a craft that goes with the lesson. The age ranges are from 2 through Kindergarten. We figure once kids finish Kindergarten, they can sit in church. We take a break during summer so kids can sit with their families, and because it’s hard to find teachers during the summer. We have a rotating schedule of teachers throughout the year. We are a small congregation and this is what works best for us. I agree that kids should be with their families during worship, but sometimes need a lesson that is more on their level, depending on their age. And, it’s perfectly fine for the older ones to learn how to sit during the sermon, color, listen and read. Boredom like waiting is part of life in the real world. People who never learn to live with boredom often become drug addicts or substance abusers. I think we are far too worried about boredom for both children and adults which contributes to why so much of church life has become entertainment to keep people young and old from being bored. I have always heard more if I was doodling or drawing. I frequently got called on it when I was in meetings and all I had at the end was a page of detailed doodling. But I remembered what was said – and that is the important part. Occupying my hands frees my mind to listen. I may look “bored” but I am very there in the moment. Absolutely. People say there kids “can’t do that” but they absolutely CAN, if you expect it of them. Soon it will be a habit and yes, they do listen. Our children are grown now, but, ‘back in the day’ there were NO other alternatives, and so we made it work! I had what we called ‘busy bags’ that they took with them. There were quiet, art-related projects or toys which they only saw on Sundays. They learned to be still and quiet and watched us praise, pray and listen. It was a good thing. Also, my oldest told me that she listened better when she was drawing or doodling. You never know what the Holy Spirit will use to speak into a child’s heart. They ARE watching, learning, and (usually) listening. Great Post–thank you! Keep up the engaging writing, Melissa.